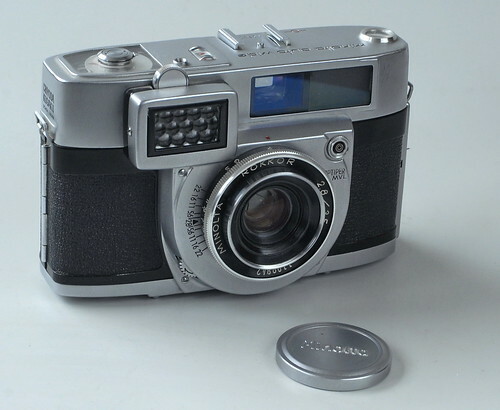 The Minolta Autowide was a viewfinder camera with coupled selenium meter made by Chiyoda Kōgaku Seikō in Japan. The Autowide has a place in history as the second 35mm camera introduced with integral coupled metering, following the Mamiya Elca by a matter of weeks in February 1957. Concentric rotating aperture and shutterspeed knob-and-wheel on the back of the Autowide were internally geared to the lens aperture and shutter. The meter readout was mechanically coupled to these knobs and also was adjustable through ASA/DIN slots on the meter dial. Exposure combination was found when the meter dial pointer matched the needle driven by the metercell's current. Aperture and shutterspeed readings were read through a magnifying port on top of the camera. Year of launch: sales starting in 1958. Lens: Minolta Rokkor 35mm/f2.8 with 6 elements in 4 groups. Zone focusing with 'P' setting for close up Portrait, 'G' for midrange Group, and 'S' for Scenery to infinity. Shutter: Optiper Citizen MVL , B, 1 to 1/500 sec with M and X flash sync. Thumb wheel self-timer. Metering: coupled selenium meter supports manual aperture/speed choice for ASA 10-1600 range. An accessory windowed diffuser for the metercell allowed for bright light reading. Film advance: Advance lever on the right side of the camera bottom with film transport indicator centered inset in fold-out rewind lever on bottom. Pushing in rewind button at bottom also releases rewind lever. Exposure counter in the camera top. The first generation Autowide included Light Value (LV) referencing around the meter dial.